Bimbo Bakeries USA, the giant bread producer (based in Mexico), which dominates the U.S. bread market, made an announcement in 2017 that they would no longer produce kosher bread. Bimbo has now made an about face and is back in the kosher market. You can read about it in one succinct entry found in the Consumer Alert section. I will try to give you the back story. It is not a rare occasion any more. A big company, after many years of producing foods with kosher certification, decides that enough is enough; it’s time to move on. 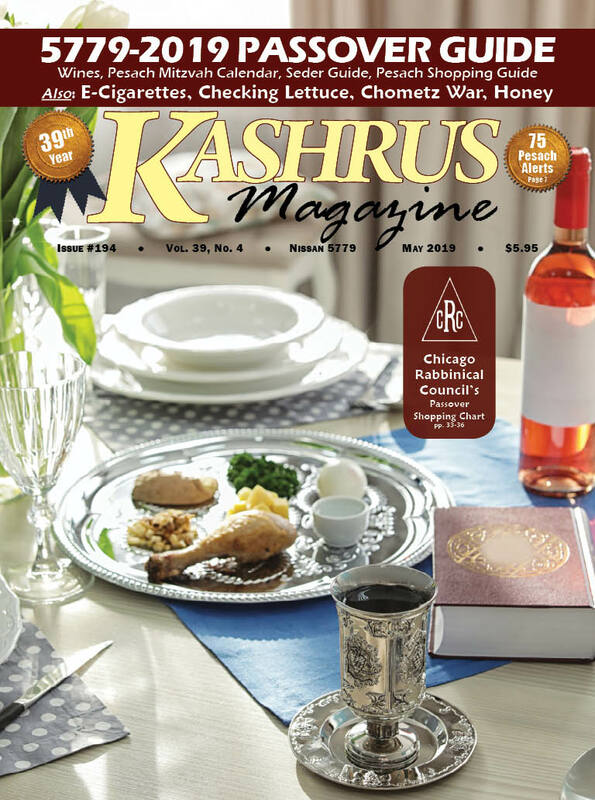 After a number of decades of kosher certification, they say goodbye to the kashrus agency which had loyally certified them, and had helped make the company a household name in the Jewish community. Then, the kashrus agency informs the Jewish community of the new development - that the company’s products are no longer being certified, and the agency supplies a telephone number/email address in their press release for anyone who would like to petition the company to renew their kosher arrangement. A few weeks or months go by, and, miraculously, the company makes another announcement - they are becoming kosher again. And, everyone understands that the email campaign worked. However, quite often, that is not what really happened. Sure, consumer pressure can move mountains. In 2014, for example, that is just what happened with Kraft and their decision to remove the “OK” certification from their Philadelphia brand Cream Cheese Spreads. The “OK” had certified that product line for many decades when Kraft made the announcement. It was no surprise to the “OK” because the company had added a bacon variety using real bacon to their list of spreads. I suppose that made it difficult to continue to certify the plant. But, with Bimbo, something else happened. The company decided to reformulate their breads and make many of them dairy. Dairy bread is forbidden according to halacha, and cannot be kosher-certified. So, the company decided to make all their breads without kosher certification. More than a year later they made the decision to go back to kosher. Bimbo said that, “After hearing from our loyal kosher consumers and after productive meetings with our kosher certifiers, Bimbo Bakeries USA is pleased to announce that we will once again be offering kosher products under the Arnold, Sara Lee, and Ball Park brands.” The kosher world knows about the first part, the letters from the “loyal consumers,” but what went on in their offices in those “productive meetings with our kosher certifiers” would fill a book, one that maybe some day we will read. It is true, that during that time, the kashrus agencies urged the consumers to write to the company. But, other factors motivated the company, and were probably the main reason for the switch back to kosher, at least for Arnold, Sara Lee and Ball Park brands of breads, hot dog buns, hamburger rolls, etc. (“OU” or “KOF-K,” depending in which bakery the bread was baked). But, there was method to Bimbo’s decision. The company had business concerns, not about the relative number of breads that they would sell if kosher or if not kosher, but technical concerns. There were difficulties in isolating their dairy breads from the pareve ones and the down time that koshering in between runs caused them pause to consider kosher as really out-of-reach. The kashrus agencies held a number of meetings with the company representatives and set themselves to understand Bimbo’s frustration. The kashrus agencies worked out how Bimbo could handle the challenges that they faced. The face-to-face meetings and the appreciation that the company had for the assistance of the kashrus agencies, seem to have been the cause of Bimbo becoming kosher again (for some of their brands). It is now a more limited list of company names going kosher to those which had once been, but this is a big win for the kosher consumer and one that should elicit consumer appreciation for the rabbis who do daily battle in the business world on behalf of the kosher consumer in this country. Okay, so the kitchen itself doesn’t cost $10,500,000, the condo housing the kitchen does. And there is not just one, but 39 to choose from, plus two townhouses and three penthouses. They are in New York City, in the Upper West Side of Manhattan, on 87th Street between Broadway and West End Avenue, all located in the 17 floor Chamberlain. The 10.5 million dollar home is for a five bedroom, but the price is only a starting price, obviously, some buyers will choose options as well. The 2 bedrooms start at 2.4 million, but, if you are buying, you might as well buy with the future in mind. The kitchens are all outfitted with the latest appliances, featuring Sub-Zero technology, and complete with a Sabbath mode. The kitchen is designed with an option of a second dishwasher, today’s absolute necessity. The laundry closet has room for a second washer and dryer for those who feel that they absolutely need them because of their family size. On the ground floor, the automatic doors will be shut down for Shabbos, a Shabbos elevator stops at each floor, and there is both a playroom and a courtyard garden for the children. Simon Baron Development had their mind set on this grouping - Orthodox Westsiders, with enough cash to buy one of these condos in their 17 story building. So they hired Susie Fishbein as their consultant. She told them about the kitchen design and about the Orthodox lifestyle. Not so long ago, Orthodox Jews were supposed to be “the poor Jews,” the Reform being the rich ones. And, now, here, in overpriced Manhattan, a number of developers are seeking out Orthodox Jews to satisfy with their offerings. Simon Baron is not alone. There are similar buildings at 441 and 535 West End Avenue, and at 91st Street and Broadway, where they seek to attract Orthodox Jews. A little miraculous, when you consider the numbers. Only 3% of Manhattan Jews consider themselves “yeshivish,” the kind that would buy a condo at the Chamberlain. That is about 150 families in that part of Manhattan. Developers must be seeking those yeshivishe Jews who currently live in other areas, offering them a chance to move to the Upper West Side and still maintain their yeshivishe amenities, people who can pay the price to do that. Pretty amazing, when you think of it. The problem with honey is that it isn’t honey; at least most honey being sold in the U.S. is not pure honey. According to research done by Food Safety News, up to 76% of honey options found in U.S. grocery stores are either “fake honey,” or they have been processed in a way that most food laws across the world would not allow them to be labeled as honey. This problem affects many areas of our lives: finances (as pure natural honey costs much more than the watered down and adulterated competitors), health (as the health benefits of honey are not present in the fake honey), safety (as the adulterated or fake honey sometimes contains dangerous chemicals, such as the cancer-causing antibiotic chloramphenicol), and kashrus (especially in regards to Pesach, since fake honey often contains corn syrup, [wheat] starch, and, on occasion, flour). There are six types of honey you should learn about. Pure Honey – This term denotes natural honey which has not been adulterated. A certain degree of filtration was done to remove debris and bee parts, but ultra-filtration was not done. This is the best of all honey, but it’s got to cost more. If water, fructose and other additives are not used, the producer has less product to sell, therefore, the price has got to be double or more what the adulterated honey will cost. Raw Honey – This version of pure honey has neither been heated nor pasteurized; it is unprocessed honey. Pasteurized Honey – This version of pure honey has been heated and pasteurized. It is like a double-edged sword – you have protected the consumer by removing any pathogens, but you have also eliminated the vast majority of honey’s natural health benefits. Sugar-Free Honey – This one sounds good on paper, but it is actually a misnomer. Honey is naturally high in sugar, so this product is not honey. Sorry. Organic Honey – To be considered organic, the bee hives must be free of chemicals or located far away from any present. Also, the flowers that the bees will be getting nectar from cannot be sprayed with chemicals, and the bees cannot be given antibiotics. Organic honey is filtered, but is not heated beyond pasteurization. Blended Honey – This term means that a portion of the product is pure honey (somewhere between 30% and 70%) and the rest is high-fructose corn syrup. This product, therefore, can be 70% corn syrup and still use the name honey.